On the lower tech end, we achieved the dream of a sewing room (complete with 2 new sewing machines!) for our wonderful volunteer instructor, who has been leading programs on NJ Makers Day for the past 4 years. 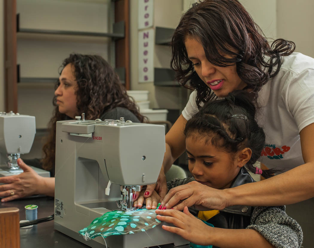 With her new set-up, Luz was able to teach participants how to make full bags, skirts, pillow cases, and more! Then, on the higher tech end, we constructed a “Robot Obstacle Course” for our youth coding club (Elizabeth Coding Club) to be able to lead on-the-spot coding instruction, while participants used SpheroMinis to race to the finish line!